Jerry Maguire begins as a redemption narrative, though it will take nearly the entire 138-minute run time for the title character to complete redeem himself from a lifetime of selfish choices. 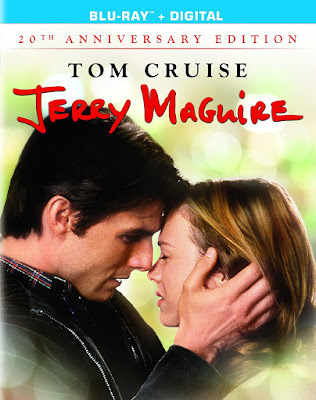 Maguire (Tom Cruise) is a top sports agent who one day wakes up to the superficiality and greed rampant in his line of work, with the film even taking an early stab at the hidden dangers of sports-related injuries. In an attempt to clear his conscience, Maguire writes a mission statement about these concerns, voicing a plea for less clients and more compassion, which ultimately gets him fired from his job at a top agency. Determined to use this setback to put his words into action, Maguire starts his own agency. The only problem is that only one of his clients decides to stay with him. This client is Rod Tidwell (Cuba Gooding Jr.), an aging football player with a huge ego and an even larger chip on his shoulder. Determined to make enough money with his final contract to support his family in the years to come, Tidwell is constantly handicapped by his inability to let go of each injustice done to him over the course of his career. Both Tidwell and Maguire are flawed individuals, but somehow their relationship helps each of them face their own faults with hope of growing. Tidwell is the only client to follow Maguire when he is fired, but the agent’s mission statement is also enough to inspire one of the agency’s lower level assistants to follow him. Despite concerns over health benefits needed for her young son, young widow Dorothy Boyd (Renée Zellweger) impulsively follows Maguire. This inevitably turns into a romantic relationship as well as a working one, which is further complicated by Maguire’s recent discovery of his own inability to be alone and a bad breakup with his fiancé (Kelly Preston). The romance in this film is not your typical fantasy fare, but instead shows the complexities of falling for another person despite their shortcomings. “Show me the money.” “You had me at hello.” “Help me help you.” There are more recognizable quotes in Jerry Maguire than nearly any other film from the ‘90s, though it was much more than a solid screenplay from Crowe which made all of these lines stick in the head of audience members. A great deal of credit also goes to the actors who so effortlessly embody the roles (not to mention the casting director that put them there). Cruise utilizes his charming persona and good looks with a flawed protagonist that makes him human and relatable, often because of those shortcomings rather than despite them. Gooding Jr. gave a performance that tapped into his own natural charm and energy, a fact that became even clearer by his exuberant acceptance speech after winning an Academy Award for the role. It was hard not to be reminded of the climactic football sequence in the film when the actor energetically took the stage to accept his gold statue. And this was also a breakout film for Zellweger, only occasionally overshadowed by the scene stealing performance by Jonathan Lipnicki as her adorable onscreen son. When this film was first released on DVD, there were plenty of fantastic special features included, and they have been transferred over for this 20th Anniversary Edition on Blu-ray. These include a picture-in-picture commentary track with the three stars and Crowe, deleted scenes, rehearsal footage, and a making-of featurette. New special features include an additional 60-minutes of deleted scenes and a 3-part retrospective with new interviews from Cruise and Crowe. There is also a digital copy, apparently, though it has yet to be made available. This may change in the near future, though many of the Ultraviolet codes included in the releases of the past month have not been working. I have contacted the service to ask why this is and have received no explanation. It may simply be a case of mistakes made during the holiday break, but these problems have affected several titles claiming to include digital copies over the last few weeks. My suggestion would be to double check the availability of the digital copy prior to making this purchase, if that is an extra which is important to you.